Ideally, the browser should detect if a newer file exists on a page and update its cache accordingly by downloading only what it needs. Unfortunately, this doesn’t always occur so, new changes or updates on a website may not be immediately visible to a user with the site cached. We Promise We Made Those Changes. In the web design world, this often presents issues for our clients who are expecting to see their changes live on the site. To reconcile this issue, a hard refresh is needed to clear out the browser cache. This will trigger the page to be re-downloaded fresh from the server in its entirety. 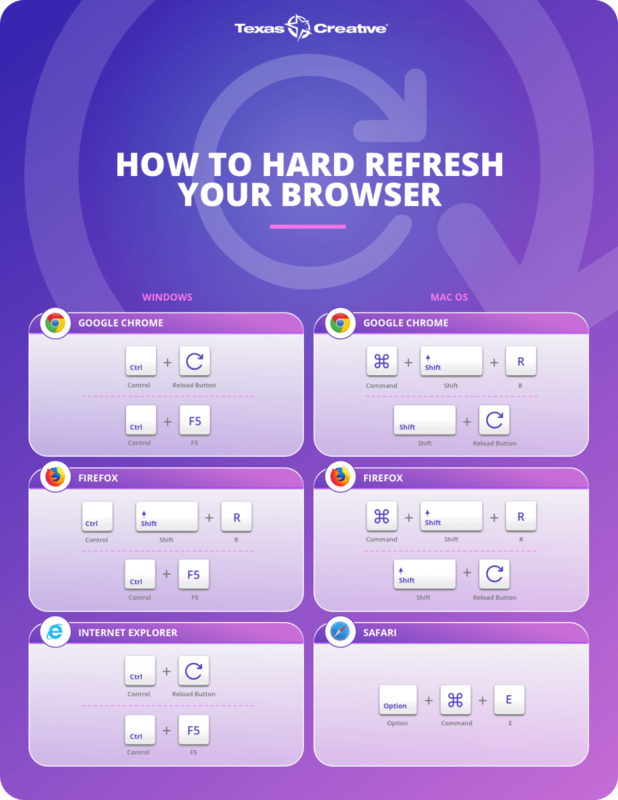 The guide below details how to quickly perform a hard refresh in various browsers and operating systems. How to Clear Cache on Mobile. For reasons unknown to the internet, clearing cache on your mobile device is much more involved. I’ve detailed the steps required to clear cache on the most popular mobile browsers. Confirm by tapping “Clear History and Data” from the pop-up window. Click on the menu button (three dots). Click on “Settings” in the menu. Select “Cookies, Site Data” and “Cached Images and Files” from the list. Click on “Clear Browsing Data” at the bottom. Having any issues clearing your cache? Drop us a comment below. For more tips check out some of our other blogs.